Do you love chocolate? If yes, then you have another reason to eat more chocolate. As you know chocolate has some health benefits and having it in moderation is good for health. But studies suggest that chocolate is good for the skin as well. But how? Let's find out. 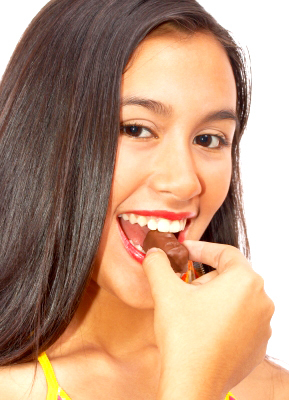 For years chocolate was associated with acne and cavities. But now scientists and researchers have proved chocolate is actually good for the health of the skin. That fact is cocoa beans are rich in flavanols, which have strong antioxidant properties. Antioxidants are very good for the skin as they fight free radicals. Besides dark chocolate gives skin the protection from the UV rays and save it from sun damage. As we know sun damage can cause early aging, wrinkles and it can cause skin cancer as well. Flavanols in dark chocolate protects skin from sunburn. Chocolate is made if cocoa and cocoa is highly rich in anti-oxidant properties. New research shows that cocoa has a higher concentration of anti-oxidants than red wine and both black and green tea. Dark chocolate does also have some minerals in it such as magnesium, copper iron and zinc. It is a wonderful skin lubricant and its natural cocoa scent is not bad either. Cocoa butter is the solid fat from the roasted seeds of cocoa plant. This fat is an interesting addition to the various beauty ingredients such as soaps, lotions and creams. If added in a large quantity, cocoa butter may give a slightly yellow tint to many cosmetics and it is used up to fifty percent as a base blend. How to Make Chocolate Facial Mask? Making a chocolate facial mask is easy and you can make it without much effort. First, arrange some ingredients such as cocoa powder, honey, heavy cream and oatmeal powder. Mix or combine all the ingredients until it is very thick and consistent. Clean you face thoroughly and dry it before applying the mask. Take the cream and massage it gently on your face. Wait for 20 minutes and wash it off with lukewarm water. Mixing oatmeal and honey makes this facial mask more useful. Oatmeal is wonderful to exfoliate the skin and honey contains anti-bacterial properties which are effective to cleanse the skin and opens up the clogged pores. Know more about natural skin care and home remedies for stretch mark treatment. During the studies, scientists also have proved that chocolate with high flavanols protect the skin from pollution, sun damage, and alcohol consumption caused by drinking too much red wine. Besides eating chocolate you can also use chocolate soap, chocolate massage oil, and chocolate lip balm to get the benefits. You can use skin creams, lotions and other cosmetics which are rich in cocoa butter. Eating chocolate regularly can help improve the overall texture and tone of your skin because the skin cells are able to repair themselves easily. Chocolate- especially dark chocolate is a great food for the skin; it is one of the best natural ingredients to nourish your skin.